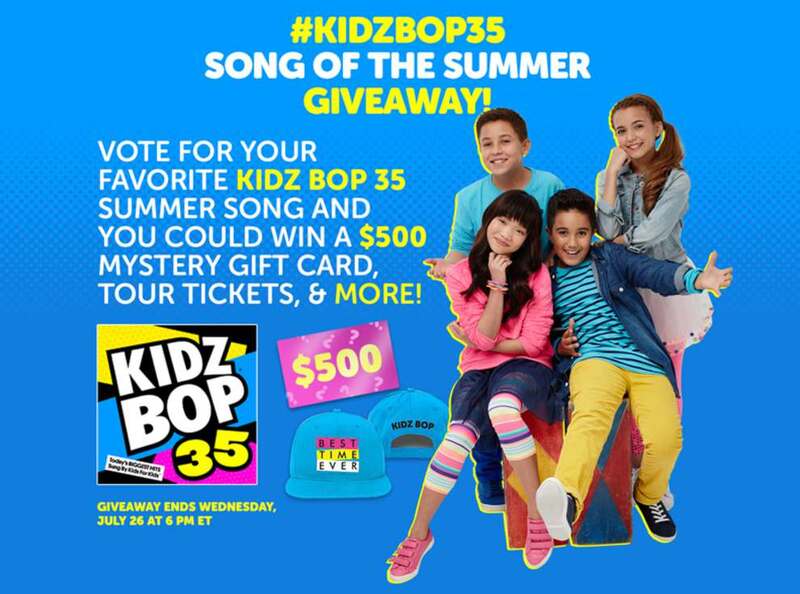 ENTER KB 35 GIVEAWAY – KIDZ BOP’S SONG OF THE SUMMER GIVEAWAY #USA. Just vote and fill out the form for a chance to win a $500 mystery gift card, KIDZ BOP 35, and awesome KIDZ BOP swag! (rules and conditions apply). 1. Promotion Period: The KB 35 Giveaway (the “Sweepstakes”) begins at 6:00pm Eastern Time (“ET”) on Wednesday, July 12, 2017 and ends at 6:00 pm ET, Wednesday, July 26, 2017 (the “Promotion Period”). The “Sponsor’s” (defined below) clock is the official timekeeper of the Sweepstakes. 2. Eligibility: No purchase necessary, Void where prohibited. Open to legal residents of the continental United States excluding Rhode Island who are 13 years old or older, with parental consent if a minor. Employees of KIDZ BOP (“Sponsor”), its respective advertising and promotion agencies, affiliates, parent companies, subsidiaries, and members of their respective immediate families (spouses, parents, children, and siblings and their spouses) and/or those living in the same household of each are not eligible. All applicable federal, state, and local laws and regulations apply. 3. How To Enter: Each day of the Promotion Period visit the official KIDZ BOP Facebook page and vote for your favorite KB35 song via the giveaway tab (bit.ly/kb35giveaway) to receive one (1) entry into the Sweepstakes. Upon voting, entrants will be prompted on how to complete their entry and will be asked for a parent’s or legal guardian’s e-mail address if under 18. Entrant’s name will be removed from participation at the request of a parent/legal guardian. Entrants are limited to one (1) entry per day during the Promotion Period; provided, however, entrants who share the Sweepstakes with friends via Facebook will receive one (1) additional “bonus entry” into the Sweepstakes after the initial entry of their friend. 4. Random Drawing: Nine (9) Runner-Up Winners (“Runner-Up Winners”) and one (1) Grand Prize Winner (“Grand Prize Winner”) (collectively, the “Winners”) will be selected at random via an aggregator software application in a random drawing among eligible entries received during the Promotion Period. Odds of winning will depend upon the total number of eligible entries received during the Promotion Period. Sponsor’s decisions as to the administration of the Sweepstakes and prize awards are final. Winners will be contacted via email by Monday, July 31, 2017. Winners first name and initial of last name will posted on Facebook on or around August 1, 2017, and contacted via the email address they provided upon entrance to the giveaway. (b): Grand Prize Winner: One (1) Grand Prize Winner will receive: (i) one (1) $500 mystery gift card, (ii) one (1) signed KIDZ BOP 35 CD, (iii) KIDZ BOP swag, and (IV) 4 regular tour tickets to a KIDZ BOP concert. 6. General Rules: Entrance into the Sweepstakes is voluntary. Upon entry, you will be asked to email Sponsor with your full name, email address and parent’s or legal/guardian’s full name and email address if you are a minor. Entrant’s name will be removed from participation at the request of a parent/legal guardian. Sponsor will email winner and/or winner’s parent or legal guardian a Prize Confirmation Form. Prize Confirmation Form must be complete and emailed to Sponsor within seven (7) days of notification attempt or the prize will be forfeited and an alternate winner may be selected. All material submitted becomes the sole property of the Sponsor and will not be returned. Acceptance of a prize constitutes permission to the Sponsor and their respective agencies to use winner’s name, biographical information, pictures/portraits, likeness and/or voice, for purposes of advertising and trade without further compensation or additional notice, unless prohibited by law. By participating in this Sweepstakes, if entrant is a minor, entrant’s parent or legal guardian agrees to be bound by these General Rules and the decisions of Sponsor. Sponsor is not responsible for technical hardware/software failures of any kind, lost/unavailable network connections, or failed/incomplete, garbled or delayed computer transmission, which may limit a user’s ability to participate. Sponsor reserves the right to cancel and or modify the Sweepstakes at will. Additionally, Sponsor reserves the right to cancel, modify or disqualify entrant if fraud, misconduct or technical failures destroy the integrity of the Sweepstakes as determined solely by Sponsor. Sponsor is not responsible for any typographical/other error in printing of Sweepstakes administration/prize announcement or for any liability for damage to any computer system resulting from participation in, accessing or downloading information in connection with this Sweepstakes. Sponsor is not responsible for any taxes, fees and/or other accommodations with respect to the prizes awarded (if applicable). 7. Governing Law/Disputes: Any and all disputes will be resolved in the appropriate New York County courts in the state of New York in the United States, exclusively, and subject to the laws of the state of New York. Should there be any conflict between the laws of New York and any other laws, the conflict will be resolved in favor of the laws of the state of New York. Further, in any such dispute, under no circumstances will any participant be permitted to obtain awards for, and hereby waives all rights to claim, punitive, incidental or consequential damages, or any other damages, including attorney’s fees, other than participant’s actual out-of-pocket expenses that are specifically associated with the Sweepstakes and participant further waives all rights to have damages multiplied or increased. 9. Sponsor(s): KIDZ BOP, 214 Sullivan Street, New York, NY 10012.